The organization bug bit me over Labor Day weekend. We had just gotten home from a relaxing week at the beach, and I still had the long weekend at home before returning to work. So, for some reason I decided that I needed to clean out the hall closet. Most people would call this their linen closet, and I think originally that’s what I was trying to use it as. The thing is, we don’t have that many spare linens – only one spare set of sheets for our bed and they are kept in our bedroom armoire. We keep all the extra towels in the 2 full bathrooms, with the exception of old towels that go in the laundry room cupboards. 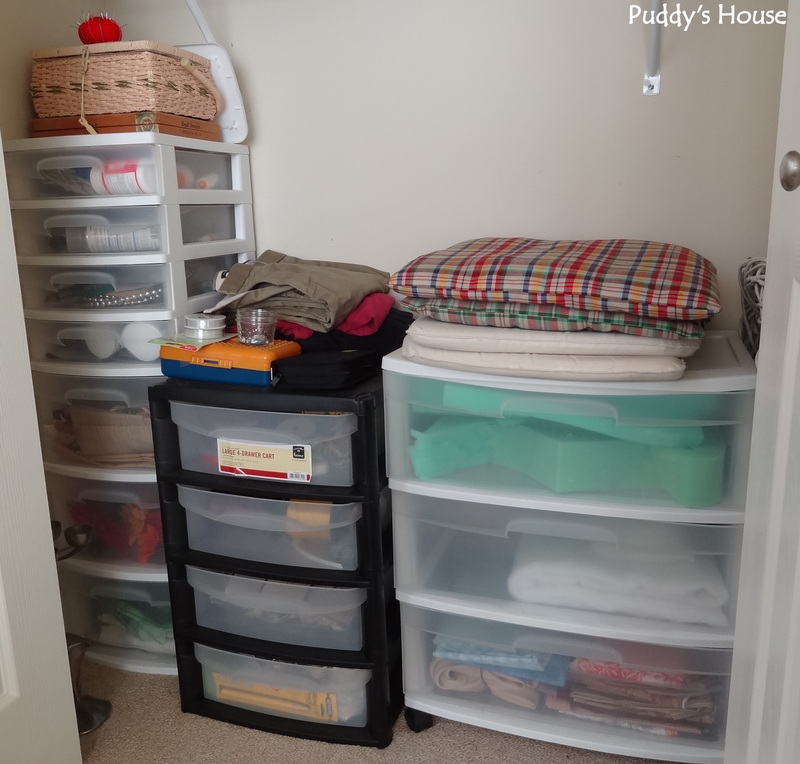 But, for some reason I had linens in the hall closet….and a bit more stuff! I started with removing everything, especially all of the comforters that we would never use! There were 4 of them. There was nothing wrong with them, just not something we would use. I gave one to family and donated the rest. As far as the rest of the stuff, I just went through it all and grouped it how it made sense once I had it out of the closet. And, this is always a case of it gets worse before it gets better. You can see in the right of that picture that there are many empty plastic containers and baskets. I gathered them from around the house and from our basement storage. 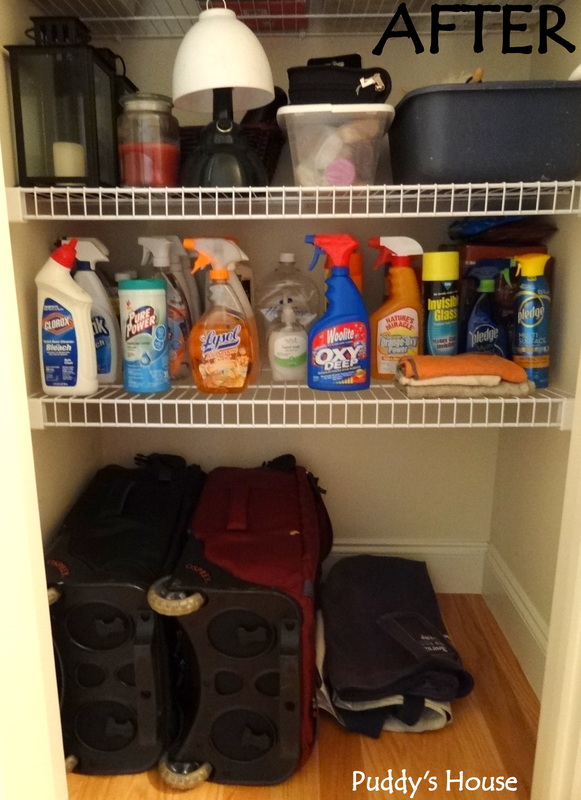 I knew I could organize this closet without needing to spend money. Sure, I could have gone out and bought pretty containers and labels, but I didn’t need them, nor did I need to spend money right now on making my hall closet pretty. It was already going to be pretty to me because it wasn’t going to be the disaster that it was. You might also notice that we have an abundance of lightbulbs! Mainly new CFL ones, but there are still many others. That took a little work. I needed a container large enough for them all, but also one that would fit on the shelves. I finally found one that I used to use in my craft closet for magazine storage – its the basket with wire front in the top right of the picture below. 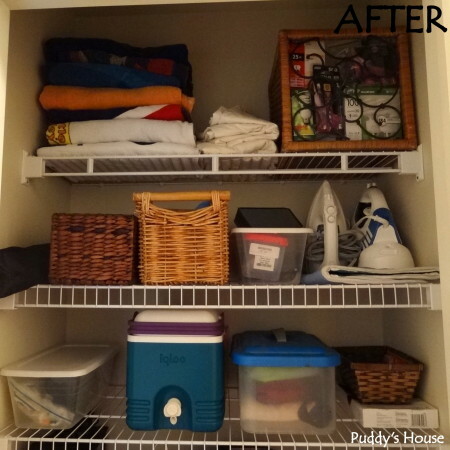 Our beach towels weren’t in the before picture, because they were in the wash, but they are all clean and stacked on the top in the after picture. There is also a partial sheet set up there; we use that for haircuts in the house. 🙂 The cameras and accessories made it into the basket on the second shelf from the top. There is also a basket with our water travel supplies. And, I hid the heating pads in another basket. Yes, we have 2 irons and I kept them both!! I like them each for different purposes, so they both stayed. 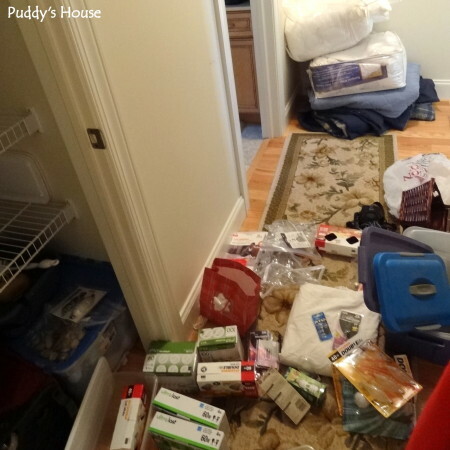 The bottom shelf in the picture above has a container full of earplugs and batteries – 2 things we also seem to have in abundant supply. The cooler wasn’t in this closet before, it came from the laundry room. 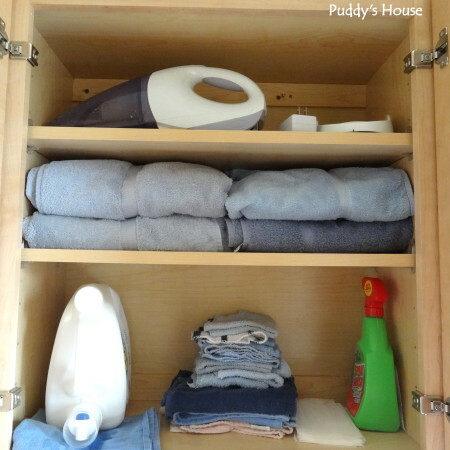 When I put everything back in, I had lots of extra space so I organized from other spaces. The container to the right of the cooler contains soft coolers. Then, the right side is rug grippers, and furniture felt and slides. The bottom of the closet got some freed up space too. I moved the tote to the basement storage room, because it was not something we accessed regularly. We do use our luggage regularly, so it was nice to give it more room and not have it crammed in there. It also allowed space for additional tote bags to be ready to grab and go. Sadly, I was storing many random items in them hanging in our laundry room closet. The cleaning supplies seemed to expand because I pulled them from the other spots in the house I had them and organized them in one central spot. It also showed me I don’t need to buy any for a while! The top shelf in the picture above contains our patio supplies. These were also previously stored in our laundry room cupboards. There wasn’t even room for them there, the lanterns were laying on the side. This is so much nicer. I have all the portable outdoor lighting in here. The clear shoebox has our sunscreen and stored above that is our travel scrabble and cards, all items that go with us to the beach and before I had stored within the beach bag hanging in the laundry closet. It wasn’t a bad system, but it just never got emptied/cleaned that way, so I think this will work better for me. The dishpan has extras like sponges, duster, and toilet brush. 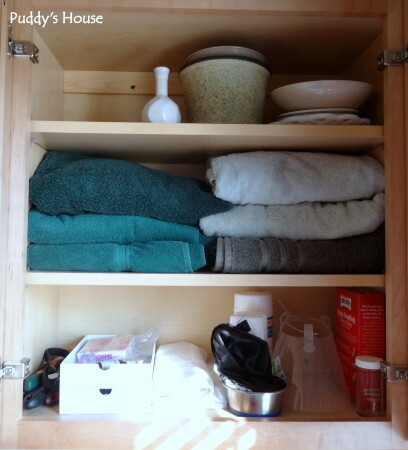 These are the cupboards above our washer and dryer, so the supplies stored in them make sense. The dust buster gets pulled out frequently to be used and then charged in the laundry room, so this is a good spot for it. And the other cupboard pictured below, has lots of Puddy’s supplies – shampoo, doggie bags, extra treats, medicine, etc. The top shelf is some extra vases, pots, and plates that I use below my houseplants as necessary. 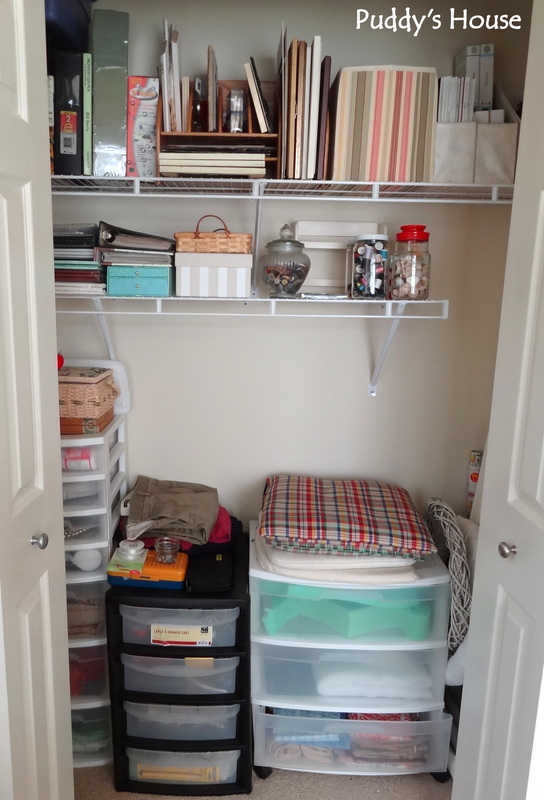 Since I was on such a roll with my organizing, I also decided to tackle my craft room and closet. 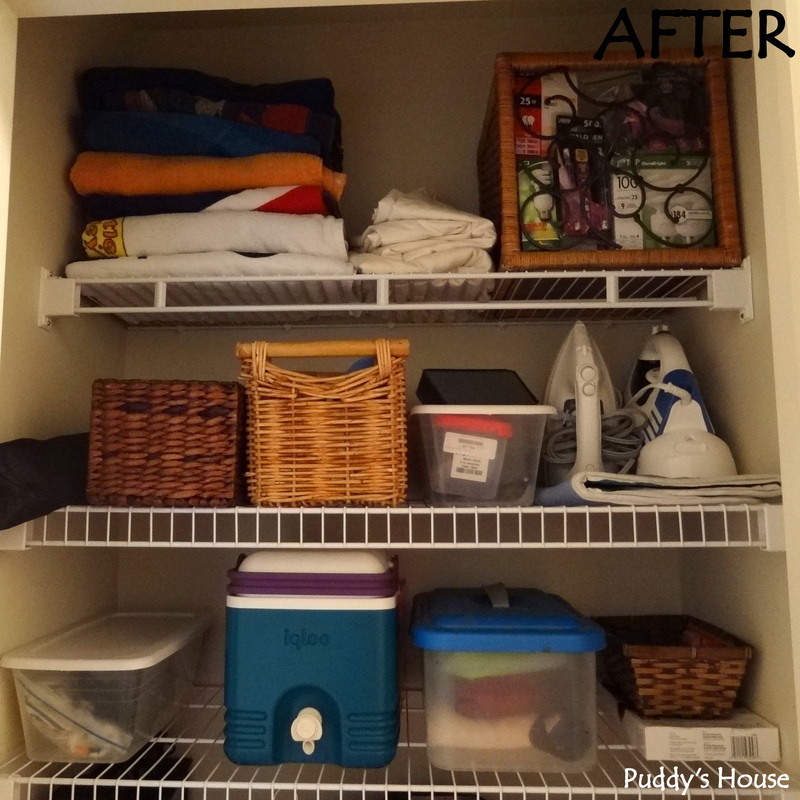 Beware, the before picture is not for the faint of heart….its BAD! Maybe I should have said that I failed to stop to take a before picture of this too 😉 nah, I’m too honest for that. It was terrible. I usually “hide” my mess in the closet, but the closet couldn’t even be closed and it had spilled out onto the floor. I had all of my Haven swag on the floor, and most of my recent thrift shopping purchases were there too. So, I got busy and decided to put items where they belong. 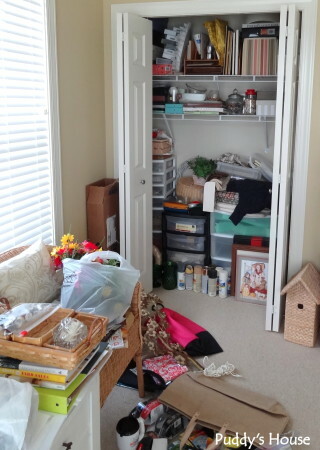 If a thrift project was going to be worked on, I started it, or at least organized it in the closet. The spraypaint was banished to my spraypaint storage in the basement. All of the extra and off-season décor went to the basement for storage too. I put it all neatly on shelves, so that I can see it and just go grab whatever item I want and bring it upstairs to decorate with it. I also tackled the overwhelming supply of old magazines. I finally admitted to my self that I never go back and read them. I have caved to Pinterest and google for searching images for inspiration instead of rereading magazine after magazine trying to find what I was looking for, so I recycled a ton of magazines to make room for items I do use in my craft closet. 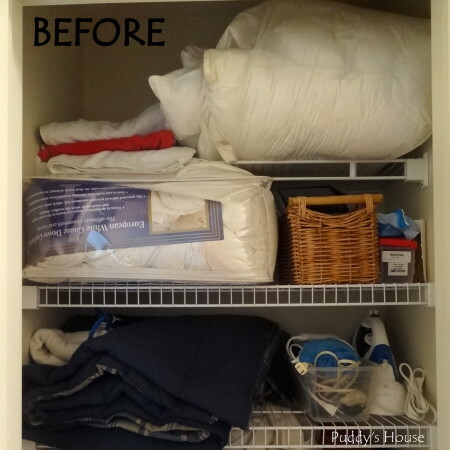 The after pictures of the closet are much more reasonable. Again, I just used containers that I had to keep it simple. 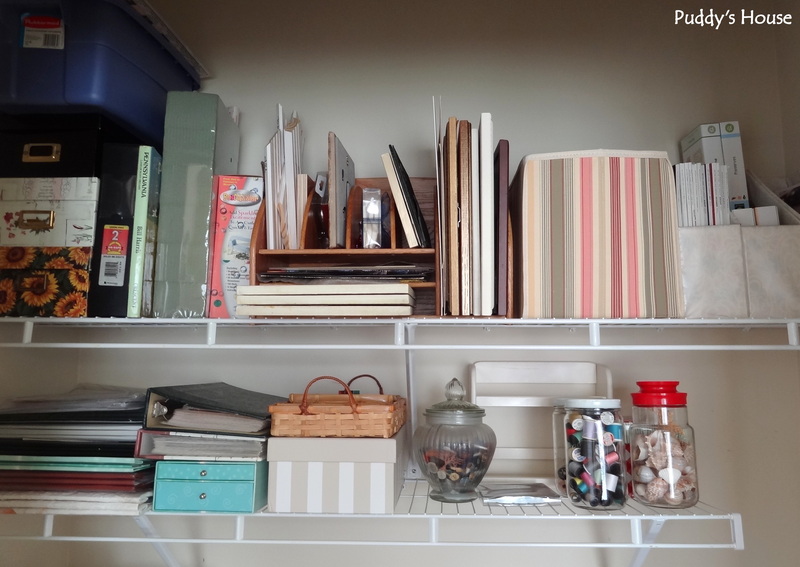 My craft supplies vary from scrapbooking, which includes picture storage, sewing, and decorating supplies. 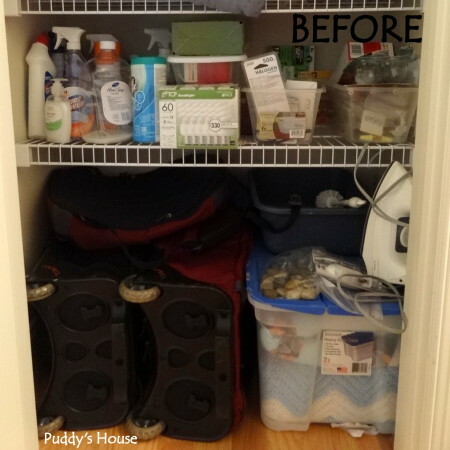 I had previously added the lower shelf to expand the storage, and that has really helped. This was just a normal “clothing closet” by design, so I have had to adjust to make it work for my purposes. I had the portable storage drawers; my friend gave them to me to put to good use. They keep everything from glue to fabric, to trim, foam, and previously a whole drawer full of sea shells. So, how do you organize? Does it need to be pretty, or just functional? Do you dive right into organizing when the desire hits you? Yes I definitely did it in one weekend. I didn’t realize that was an accomplishment itself, so thank you!